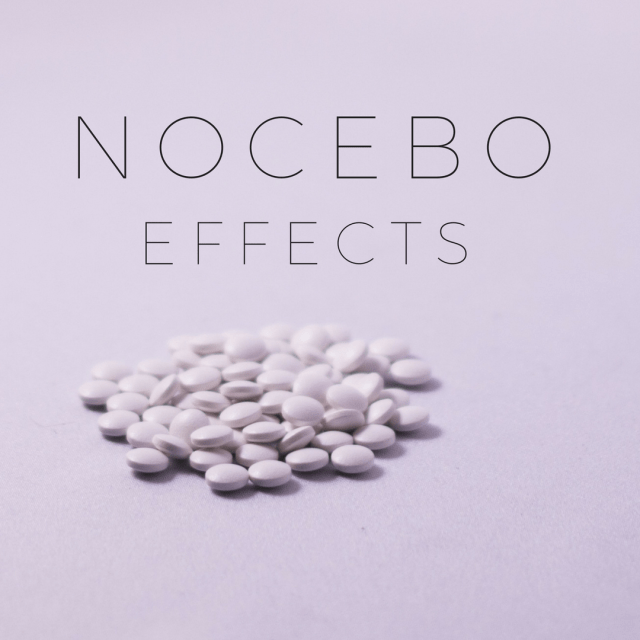 Sciblogs | What is the nocebo effect and why is it important? And what is a systematic review? In this Psychology Report, I talk with Rebecca Webster who is based at King’s College in the University of London, UK. In this conversation, we focus on Rebecca’s work on a systematic review of the ‘nocebo effect’ – what it is and how it might work. R Webster: Yeah, so we all know what the placebo effect is, it’s the kind of positive outcomes or a healthy improvement after receiving a sham exposure or a sham medicine. Whereas they don’t tend to know about the more kind of sinister side of the placebo effect, which is known as the nocebo. And it’s just essentially the opposite, so it’s where we tend to get obnoxious or an unpleasant symptoms in response to a sham exposure or a sham medicine. I’m kind of interested in how these nocebo effects can actually kind of play in the course of people developing symptoms to their medicines and actually this might be the cause of the nocebo effect, rather than actually due to the medication itself. S Johal: So, we get these negative effects of taking something that actually should be biologically inert, or some intervention that actually shouldn’t have an effect, but we experience negative consequences because of it. RW: Yeah, exactly. Just kind of all to do with these expectations and how these can actually go on to then make someone actually develop those symptoms, just showing how powerful these expectations can be. SJ: Why is it important, this nocebo effect? Can you give us a few examples as to why it is that we should be considering these negative consequences of things that shouldn’t actually have an effect upon us. RW: Yeah, so for me, we’re kind of looking at the nocebo effects and to do with kind of active drugs or active medications, so it doesn’t always have to be a biologically inert substance. For example, we all know that patient’s experience side effects from their medications. But what we don’t all tend to know is that the majority of these side effects tend to be quite non-specific, and so those aren’t always related to the pharmacological reaction of the drug. They’re the symptoms that tend just to happen to everyone in everyday life, just as feeling a bit tired, getting a headache, that kind of thing. 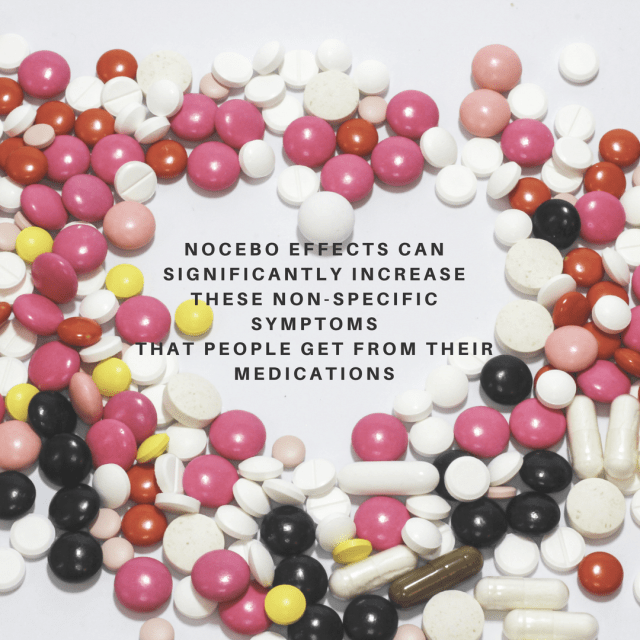 And the evidence suggests that nocebo effects can significantly increase these non-specific symptoms that people get from their medications. And obviously this isn’t nice for them. It results in distress. It’s obviously quite a significant cost to health services because of the increased medication non-adherence, so a lot of medication would go wasted because of this. And then the extra treatment visits because people aren’t taking their medications as advised, and also the additional medicines that can end up being prescribed to treat these nocebo effects. So that kind of how I got interested in kind of how we kind of combat these nocebo effects to do with kind of the more non-specific symptoms that people experience from their medications. SJ: So there’s a few different things there, then. So you’re saying that when people are taking medications, that they can experience symptoms, and then they may attribute those symptoms that would just probably be happening anyway, that many experience to the medication. SJ: And that can actually make them stop taking their medication, because they wanna reduce those symptoms, which they think is being caused by that original medication. RW: Yeah, exactly. Of course this then results in a whole load of extra costs, and people maybe aren’t so aware that a lot of these symptoms are just kind of people falsely mis-attributing them, or to do with these expectations. It’s not actually to do with the pharmacological action of the drug. SJ: Right, so one of the things then you mentioned though is that people have perhaps expectations around what the effects of a particular medicine might be. Tell us more about how that works. RW: Yeah, so quite often patients will get these expectations from either their doctor or their patient information leaflets that they get with their medications, and these can list a whole range of potential side effects. And this kind of just increases their expectations that that will happen if they take it, and so what then happens is once they’ve taken the medication and patients will tend to look out for, or notice kind of symptoms that they’re feeling or sensations, and kind of attribute them in line with their expectations and kind of ignore inconsistent information. And so they’re basically looking out for this information to confirm their expectations, basically. SJ: So this is an interesting example of that confirmatory bias, isn’t it? Because you’re expecting this, you’re looking out for it, and when you see it, you attribute it to what you thought was the cause anyway. So you end up in this little loop. SJ: And we discount the non-confirmation evidence that we may have in front of us. RW: We don’t see that in line. Anything that’s not in line with our expectations tend to just kind of brush aside. SJ: Right. And so we get these expectations perhaps from our interaction with our doctors, or the health professional … from the patient information leaflet. Are there any other influences on that, like individual differences or perhaps talking with other people who aren’t medical professionals. Can they be influential? RW: Yeah, so one of the other ways in which people can get these expectations is through media and reports and news articles to do with the potential kind of side effects to this new drug. So, for example one of the ones we had in the UK was there’s quite a lot of negative press about this drug called Tamiflu, which was used as a prophylaxis during the Swine Flu (H1N1) pandemic. And there was a lot of reports of side-effects to do with this drug called Tamiflu. And people were saying even that if they’ll be prescribed it because they’re at risk, they still wouldn’t take it because of these medications. Which is not something you really want to hear in a public health crisis, and basically the side-effects reported during this time vastly exceeded what we expected from clinical trial data with the drug. And so it was thought that this kind of negative press from the media was driving these symptoms and these negative expectations. And then there is kind of a hint to some kind of individual differences such as personality, so things like if you’re pessimistic and tend to have a negative outlook on what could happen, that kind of thing, and they make you more like to experience a nocebo effect as well. SJ: That’s really interesting around this kind of media amping up of the number of symptoms that were reported. What other things were you interested in when you started your review? What were the other sorts of possible mechanisms of action for the nocebo effect? RW: So we kind of just left it open to kind of see what was in the literature, so we just wanted to get an overview of all the different kind of factors that studies had investigated in trying to predict whether someone would experience a nocebo effect or not. So, one of the main things obviously was expectations, which came out of the literature, but there’s also stuff to do with kind of learning, so a lot of studies looked at your previous experience with an exposure and how that could then make you more likely to experience a nocebo response if you were to be exposed to it again. And things like classical conditioning, so if you associate symptoms with a certain exposure, and then you get exposure on its own, you can then go on to develop the same symptoms again. So kind of this whole learning aspect as well was another kind of big part of the literature that came out. SJ: There’s an idea around a safe dosage as well, so it’s about the amount of the medicine or the drug that you’ve had. People associate or have different ideas, depending upon the amount that they think that they’ve had. Is that right? RW: Yeah, that’s right. We linked that to being due to this expectation thing again, and it was one we didn’t really think ahead that would come out of the review, and that’s quite a lot of studies had looked at this. So yeah, it was just kind of those that thought they were getting a higher dose of something, even though it was just a placebo. It was just an inert substance. And we’re more likely to experience symptoms on that kind of thing. So yeah, so we kind of concluded that doctors also should bear in mind patient’s dose expectations or what they perceive that they’re getting, and try and correct any unrealistic perceptions they may have about how much they’re getting of a medication. SJ: So I’m jumping ahead of myself a bit here, so I apologise for that. But perhaps we can just take a step back and explain what a systematic review is. Because people may come across this term quite a lot, and it’s sometimes appearing in the media as well. What does a systematic review mean? How did you go about doing that, in simple terms? RW: Yeah, so basically it’s a review where you want to answer a question by using all the studies that is available in the literature that’s relevant to your question by searching for them with certain defined search term or words that you know will help bring back relative articles. And so you kind of develop a search strategy that you know is gonna be sensitive enough to find all the relevant articles that you need, but also specific enough so you don’t have a huge amount of irrelevant articles that then is an unfeasible amount to go through. RW: And so once you develop these search strategies, you might need to do a few tests with their own piloting to see what studies are coming back with them, with the search strategies. And once you’ve developed your search strategy, you then basically have to go through pretty much every article. So first of all with all the results that you get, you kind of just look through the title and the abstract, or the little summary they have in the article to see if it could be potentially relevant. RW: And then once you’ve gone through all them, you then have an inclusion criteria. So when you’re reading through the full text, you make sure that they’re ticking off your inclusion criteria to be included in your review. And so it’s a very systematic process. You’re going through it step by step, and it’s all set out in your protocol, or in your article so that realistically if anyone wants to carry out your systematic review again in a few years time, they can know exactly what you did and how you did it, and basically be able to find the same results again. So that’s just basically it in a nutshell. SJ: Exactly, you’re being very methodical, and I think you summarised it nicely there at the end, is that actually through writing out what it is and how you did it, somebody else would be able to replicate that and come up with the same studies that you found. So once you’ve got those studies and you’ve refined them down, what have you noticed about them in terms of the range and also the quality as well of how they did their work? Because you’re trying to synthesise all of what they’ve done, so you want to try to compare apples with apples, rather than apples and oranges. How do you sort that out? RW: Yeah, it was hard. We did get quite a mix of different studies. Some studies have been looking at healthy volunteers, and some studies will be looking at patients, and so it was kind of hard to group them all together. In the end we just decided to stick with studies that grouped them into different risk factor categories. So if they were looking at this kind of factor and how that contributes to a nocebo effect, that could kind of go into one group. And so that’s how we decided to group them. In terms of the quality, a lot of them it was questionable, so a lot of the time studies don’t put enough information in their article, in their manuscript to be able to answer a lot of the quality check questions, and also they might not necessarily have a pre-published kind of protocol that you can back and check to see if what they said they were gonna do is what they actually did. And so a lot of the times it was unclear how they were on a quality check item. And so the studies that kind of did follow the quality checks and were scoring low risk of bias on those did stand out, and were kind of few and far between. So yeah, it was difficult, and we did make a note of that in the review. A lot of studies kind of failed on that point to kind of be as clear as they could be about the quality and the risk of bias in the studies. SJ: There are several tools out there that you can use, isn’t there, that assist the quality or risk. And that’s important because if you put rubbish into review, you tend to get rubbish out. So you really need to be quite careful around the quality of the articles that you allow yourself to include in the review. RW: Yeah, so those that scored as a high risk of a certain bias on one of the quality checks, we made a note of in our tables in the review and incorporated that when we’re getting through to results to see what the study said. Was it a high quality study so we could have more confidence in that result, or if it was more of like a lower quality study, we should have more … there should be more questionable about what we can draw conclusion-wise from that study. SJ: How long did all this take you to do, Rebecca? RW: It took a while. So it was one of the first large-scale systematic reviews I’ve done, so it was challenging. I think the search strategy started in December. So I first sent it in to the search database was in December 2014, and I think I submitted it to Health Psychology Journal in February 2016. So it took about a year and two months. So yeah, it took a while. Sarb: Yeah, and that’s interesting, isn’t it? Because I think people underestimate the amount of time it takes to do something like this. It wasn’t like you were going out and doing experimental work. This was a collation and a review of work that was already existing out there, and it took you over a year to get that out. And then I think it was eventually published in December last year. Is that right? RW: Yeah, so it had an online first in September, but it wasn’t actually in the journal until December. So yeah, a long process, but worth it in the end. SJ: It is, it is. It’s definitely worth it, because like you say, there’s not been anything done like this before. So let’s get down to the real crux of our conversation. What is it that you found in your review? What seemed to be the pivotal factors in influencing this nocebo effect? RW: Yeah, so after screening all the articles, we ended up with 89 studies that were included in the final review. And these studies looked at kind of 14 different risk factor categories. And these could have been experimentally manipulated, so for example the researcher could have influenced nocebo responses by suggesting different types of symptoms to expect. Or they could have been baseline risk factor categories, so things that just tend to naturally occur within an individual, such as their personality characteristics. RW: And so we have these 14 different risk factors, and we found the strongest and most consistent predictors of whether someone’s going to experience a nocebo effect was if they have a higher perceived dose of exposure. If they get explicit suggestions that the exposure’s gonna trigger any type of symptoms. Also if they tend to observe other people experiencing symptoms as well from the exposure. And just also their own expectations they might have about the supposed exposure that they’re receiving as well. So those are the main risk factors that we found in this review. SJ: So none of that seems particularly surprising. It fits in line with what you were saying before. This idea that if you have a suggestion that there may be some kind of symptom that may be derived from the medication or the intervention, than you’re more likely to experience that kind of a symptom. If you see through social observation like perhaps media like you mentioned before, then you’re more likely. And the idea that you have a higher dose as well. That seems to have an impact as well. So who should care about this? What’s the relevance of this? What’s the point of understanding these influences around the nocebo effect? RW: Yeah, well I think for this review especially we were … I think the health services such as the NHS in the UK should definitely care about the findings. Because obviously a lot of money is spent as a result of these side effects that patients experience, and the NHS may not be fully aware that a lot of this money could be saved if you could try to reduce the side effects that occur as a result of this nocebo response. And in addition, doctors as well should care about these findings. They might not be always aware of this nocebo effect concept, and so this paper could also help educate them, for them to also understand to how best to communicate with their patients, and what different risk factors there may be for their patient to have a nocebo response to the medication. And I guess by looking at these risk factors, this paper can also help change things by helping the NHS to save money by providing different ways in which we can develop evidence-based interventions to help mitigate these nocebo responses to medications in the future as well. SJ: I can definitely see that, particularly when you mentioned beforehand the idea that people may stop taking their medication as a result of experiencing symptoms, and then thinking that these symptoms were caused by taking this medication. I can see why that would have a possible very significant clinical impact, and then knock on cost effects for the health service. And then there’s also the idea that doctors may prescribe further medication to help manage the side effects. And then you end up into this myriad of prescription drugs that people are taking. Whereas actually, there may be a psychological mechanism that could be leveraged to try to stop this from occurring. SJ: Has there been any research done on the idea of psycho-education? Because often the idea of alerting people to certain experiences that they may have … I’m particularly thinking about my day job in disaster mental health. Often there’s this idea of psychological first aid. We’re orienting people to the experiences that they may go through after going through a disaster. I’m wondering whether there are potential downsides of that by telling people “Expect to feel like this, but you’re gonna feel okay”. I wonder if you’re actually increasing the likelihood that people will experience that symptom. RW: So in terms of the disaster aspect, as far as I’m aware, I’ve not come across any study that’s looked at that. But I can see where you’re coming from, and this could obviously be quite important in disaster research if you get them to go through this experience, and it could actually end up being a detriment to their mental health if they’ve had to go through this expectation of how they might feel after such a disaster may occur. But as far as I’m aware, I haven’t come across any research that’s looked at that. But it’s an interesting side to it which I haven’t necessarily though about before. SJ: Do you know if there’s anything around this kind of psycho-education field where doctors … and how they explain symptoms, but also these patient information leaflets. Have there been manipulations done on that in terms of how that may be framed differently, and the impacts that that may have on people’s experience of symptoms? RW: Yeah, so there’s been a few studies looking at how doctors should maybe emphasise the treatment benefit rather than focusing or dwelling too much on the side effects of the medication. I think there was a study recently on that, but I think it only looked at symptom expectations, not actually if it affected actually symptom reporting. And then there has been a few studies looking at framing patient information leaflets and trying to look at it a bit more positively in terms of the number of people who remain side effect free, rather than the number of people who will get side effects. And so there’s one in 1996 to do with … I think a flu vaccine, looking at how that influence is such important to the vaccine using this kind of positive framing. And it’s also an avenue that I’m looking down as well to do with my PhD as a possible way of trying to mitigate these nocebo responses to medications as well. SJ: That’s really interesting, the idea of framing and accentuating that positive part of the envelope, where you know this is the number of people who stayed symptom free, rather than this is the number of people who experienced side effect symptoms. That’s a really interesting way of framing it. In terms of positive advice for clinicians or patients, what else, how else can they perhaps change their own experience or risk of developing side effect symptoms and attributing them to the medication? If there were three things that you were gonna advise a doctor to do, what would they be? RW: I think doctors can really help manage the patient’s expectations by remaining positive and emphasising the benefit of the treatment, and also kind of maintaining a positive relationship with their patient, it goes a long way as well. So if the patient has enough confidence in their diagnosis and their treatment plan, this confidence can then go a long way to help reducing these nocebo effects as well. And so that’s what I think doctors and clinicians should be more focused on doing. I guess the other way as well is these patient information leaflets. So about 70% of patients will read these leaflets if they’re prescribed a new medication, and the side effect section is the most commonly read section of this leaflet. And so definitely trying to improve the communication in these to make them more patient orientated and reduce the negative expectations could be quite an easy and also a cheap intervention to help reduce this nocebo response as well. SJ: You talked a little bit about the influence of the media. I’m wondering whether any studies done, or are you aware of any research around the use of internet fora where people are perhaps connecting with each other around experiencing a particular illness or a disorder, and then medications associated with that? And then talking with themselves around what they’re experiencing, and how that influences their attribution of side effects or other experiences? RW: Yeah, that’s a really good question. As far as I’m aware, no I haven’t come across any study that’s looked at that, but it is a huge part of it, so even when we say we could look at modifying this information in these patient information leaflets, a lot of patients go back home and they go on the internet and they Google their medication. They go on these forums as well, so it’s another huge avenue that I think is kinda untouched, and hasn’t been researched before, which could be a huge way in which people can also … this could also be contributing to this nocebo response as well. SJ: I can see that happening, with particularly their own experiences, but also if you look at some of the internet fora associated with parenting as well. You know, because often people are looking after their children’s medications, and worrying about what the impacts of that might be. And you hear all sorts of stuff around vaccinations and all the rest of that were people can have quite poor information and making quite big decisions on the basis of that really poor information. So I wonder about the amplification effect of that? RW: One of my colleagues, another PhD student, is looking at parents expectations and their beliefs about the child flu vaccine, and whether or not they get their child vaccinated … looking at the why the side effects play an important part in that decision. And so it is yeah, another whole way in which parents could be contributing to this nocebo response as well just from their own expectations and how this influences what they perceive in their child if they get a vaccine or a medication and that kind of thing. SJ: That’s an interesting point, isn’t it? It’s about who is the gatekeeper around this when you’re talking about family systems. ‘Cause I think the other way, looking one generation up as well. Often when people have aged parents where they perhaps are at that interaction with a GP or in a hospital, often they’re also involved in that decision-making for that person who is undergoing treatment, who may be aged or not able to process the information as well as they used to be able to do. So yeah, its whole systems here, isn’t it? It’s not just one person. RW: Yeah, its whole generations of the family that could be affected by this, so yeah, it’s important that we try to find ways to try to communicate this information in the best ways possible, without causing any unnecessary or over- the-top negative expectations of potential side effects of any medication. 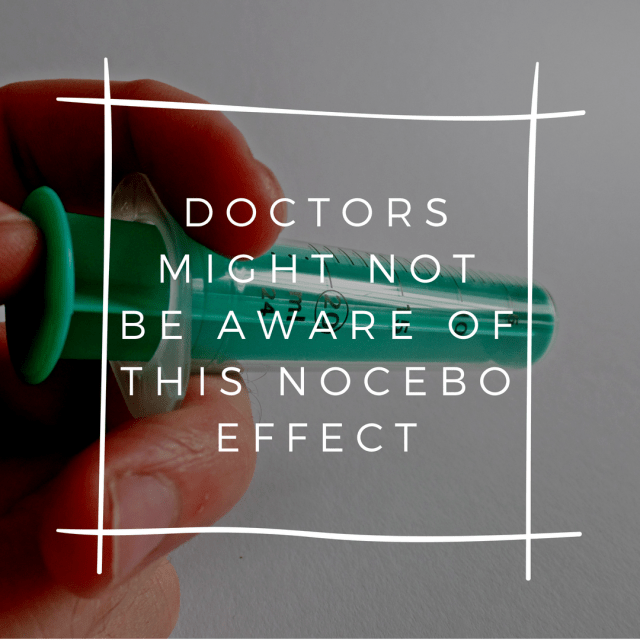 The post What is the nocebo effect and why is it important? And what is a systematic review? appeared first on Sarb Johal.